The online media landscape is fast-changing and growing at a rapid pace. But, it isn’t just the only one. The reform in India’s telecom system and 4G adoption has brought Internet service to even more users and they’re consuming a lot more content than they previously used to. According to Indian video streaming giant Hotstar’s India Watch Report 2018, online video consumption in India rose by close to five times over the 12 months of 2017. It further asserts that 96 percent of data was spent on long-form video (longer than 20 mins), which is a significant feat for the app. And it’s not at all limited to a section of the population. 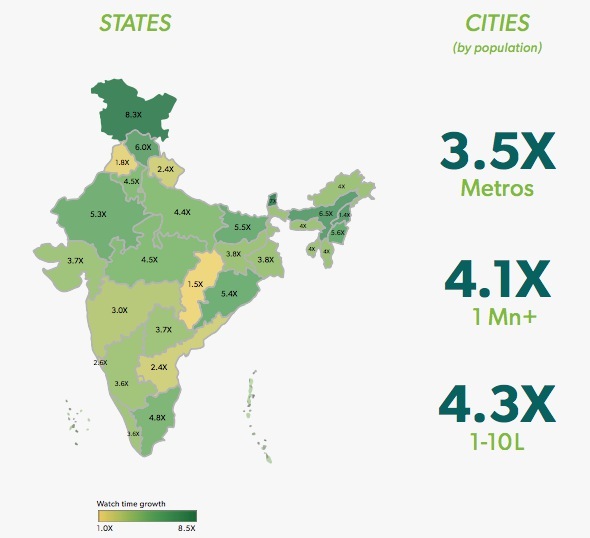 Though not too surprising, the report has shown us that the growth in smaller cities of the country was way higher than the metro cities, which is natural as more new users joined the app from these areas. The metro cities witnessed a 3.5x bump in consumption whereas remote areas were far ahead with a 4.2x increase in traffic, according to Hotstar’s research. As for individual states, the growth was highest in Jammu and Kashmir (8.9x) while it was seen that Chattisgarh saw the lowest increase (1.5x) in consumption. The users in UP, Bihar, and Kerala led in terms of the data consumption. Hotstar also found that users in rural or non-Metro areas also stayed up as late as those in the metros to watch videos on the app. A new generation of users are emerging in India who take for granted round the clock access to the best stories; who know that they can watch the best shows from around the world at the same time as the world. The report then goes on to shed light on the fact that more than 90% watch time for video content is taking place on mobile devices. And it also reveals women from smaller cities are now flocking to Hotstar twice as faster as the women in metros. 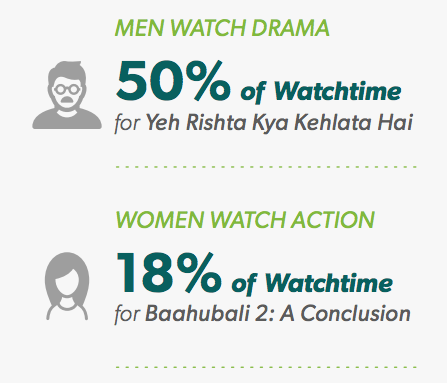 And the content is helping break stereotypes as 50% males were found to be avid consumers of family dramas; in comparison only 18% of the female users turned their eyeballs to action content, which Hotstar says is down to the success of Baahubali. This reveals that users in India have finally outgrown their reservations for high spends on data charges. They’re now openly watching content on the Internet, expanding the horizon on what they can learn and do with the power they’ve been handed down.